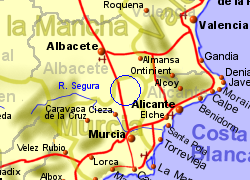 The town of Jumilla lies in an agricultural area of the north east corner of Murcia region. 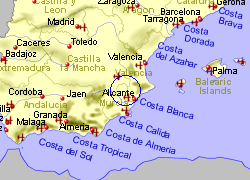 It is also an important wine producing area, a fact that is very evident in and around the town by the number of bodegas producing and selling wine, though perhaps not quite so well known outside of Spain. The municipality of Jumilla covers nearly 1000sqKm, making it one of the largest in Spain. The town sits on the side of a small hill which is topped by a castle dating from the 15th century, although the town's history goes back at least to Roman times. Jumilla is well supplied with shops and bars, and you will find a number of small shady parks. The tradidtional market, part of which is within a permenant building, is held every Tuesday. 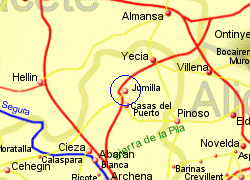 Map of the Jumilla area.